Your account comes with a set amount of keyword credits. If you run out of keyword credits and don&apos;t want to pay to purchase another keyword credit, you can release other keywords you have previously purchased to free up keyword credits. This article will show you how to release a keyword from your account. 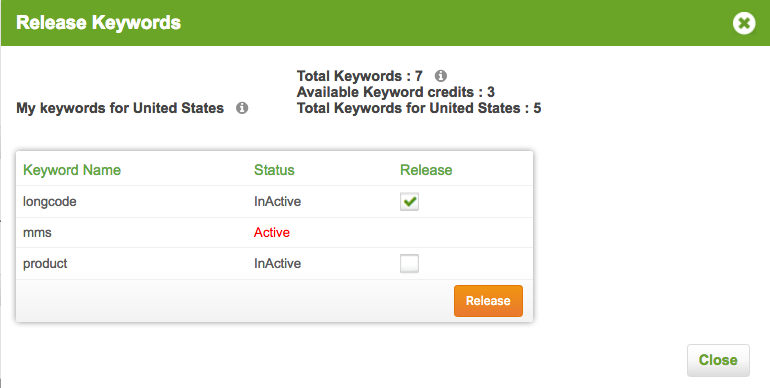 2 - Click the checkbox to the right of the keywords you would like to release, then click the orange release button. Your keywords must be inactive in order to be released. If your keywords are active, they are still assigned to a campaign in your account. You will need to un-assign the keyword before it can be released.